Love New York? Well, we've got a map just for you! Perfect for decorating your apartment or home, this New York Map Framed Print is a lovely way of showing your adoration for this lovely city. The map features a bevy of colours including brown, grey, turquoise and orange. 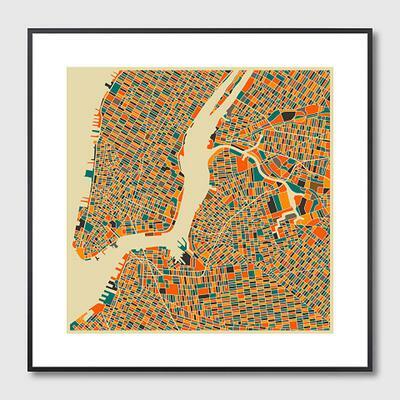 It shows off the areas of Manhattan, Brooklyn and Queens along with beautiful colours on the print. The print is made on high quality smooth archival paper. It's paired with a white matting and a gorgeous wooden frame. Shatterproof perspex cover the entire piece instead of glass so it's definitely going to last for a long time. Great for your bedroom, office area or even inside your hallway.